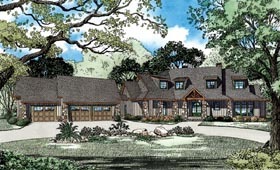 This beautiful rustic plan is detailed with stone columns around the large front porch and on the corners of the 3-car garage. Inside you'll find plenty of space and amenities for the whole family. The great room has a fireplace and optional built-ins, perfect for an entertainment center and has access to the large covered grilling porch which features a fireplace. The kitchen features a wrap around peninsula with plenty of bar seating and a huge walk-in pantry. The kitchen is open to a breakfast nook and the hearth room. Guests will enjoy the guest room, located down from the kitchen, with a large walk-in closet and a private full bathroom. The master suite features 2 large walk-in closets, a corner whirlpool tub, corner glass shower, double vanities and a linen closet. Upstairs you'll find bedrooms 3 and 4, each with their own walk-in closet and full bathroom. There's also an enormous bonus room/home theater/game room, full of possibilities, and there's even a separate computer room. Question: Do you have any other versions of this plan? We were hoping for a larger patio and a kitchen that is more open to the living room and has room for an island. We would like to order as soon as possible, but I'd love to hear from you before we do just in case there is a plan that would work better for us. Answer: Good afternoon! We do not have a version with the exact changes requested. However, this can certainly be modified by us or by your builder. Thanks!